In many markets, about a third of people use only their mobile to make purchase decisions. This really calls for brands to shift their mindsets to mobile first as a brand marketing strategy. Understanding customer intent is critical to delivering on the customer need. Intent is the new black in digital marketing (see post link below). Google has defined four key moments when we are online. When a need arises, consumers quickly turn to Search on, say a Google and a YouTube to find a resolution to that need. These needs arise when a consumer wants to know something, wants to go somewhere (on a holiday, to a restaurant, to a business location), wants to do something and wants to buy something. Simply put, these are the four basic need states that digital marketing needs to answer. 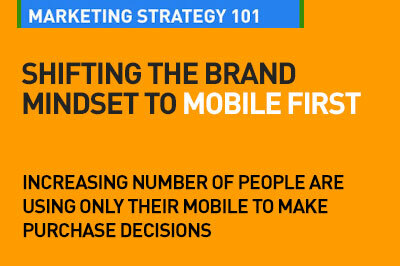 The brand marketer's mindset needs to wake up to this new mobile first world. A surprising amount of people go through the whole decision making and purchase process entirely on mobile. It's a huge shift in consumer behavior, not merely a device trend. With the huge increase in mobile consumption, we're now discovering the power of consumer intent as it happens, moment by moment. With processing power, storage, and bandwidth increasing exponentially, smart phones are increasingly becoming the device of choice for interacting with brands, gathering information, sharing, and purchasing products. Today, your website being mobile friendly is not enough. The shift from mobile ready to mobile first is what matters. And I am not talking mobile first as a design philosophy. Mobile first is key to your digital marketing strategy. Today brands are able to interact with customers any time, any where and and engage in a meaningful dialog with them. Rather than throw a bunch of advertising messages out and hope your customers not only see them but also act on them, you now have the opportunity, via mobile, to engage your customers directly with the precise information they need at the moment they need it to make a buying decision. That alone is a big reason to develop a comprehensive mobile first strategy as soon as you can. It is a part of the context of the user. So, what device am I on? Where am I? What time is it? What situation am I in? All of these signals provide an opportunity to deliver personalized experiences, and as marketers, our job is to try to address these moments with the right content. e-Consultnacy tells us that research by xAd has highlighted how crucial mobile is in the path to purchase. In a survey of 1,500 consumers, 39% cited a smartphone as the most important tool used to research a product. What’s more, 29% admitted that it was the only tool they used to make a purchasing decision. With 56% of consumers buying immediately or within the hour after researching, the ‘always on’ nature of mobile means that marketers need to place more focus on engaging consumers in the right time and place. Remember, mobile first is key to your digital marketing strategy. Please read the posts below for more insights on mobile as part of your marketing strategy. Getting the basics right is key. That's part of your Digital Marketing Strategies 101. Thanks for the useful reminder on Mobile First. Missed your posts for a while. Welcome back. educate students in the area of digital marketing, digital tools and strategic marketing concepts.